View more Impressed Textures in our Gallery! Contact us today to request samples of our Impressed Textures line. 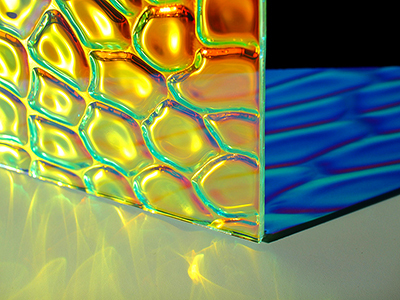 Samples include our most popular textures with dichroic film on a variety of substrates. 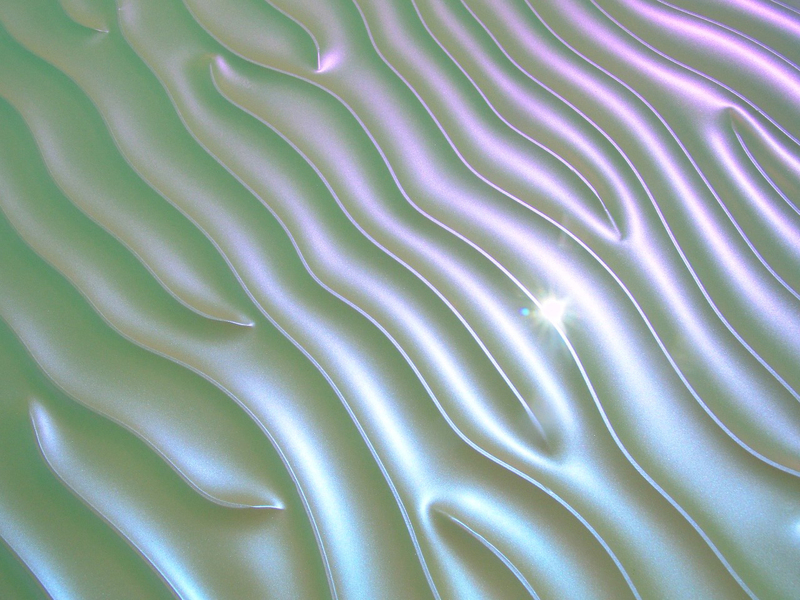 This Dichrolam product is manufactured using our proprietary method from hand made molds to create heavy topography in the dichroic layer for rainbow color effects within the texture. Unlike cast or kiln formed glass, our molded textures are smooth and graceful without sand imprinted micro-texture. 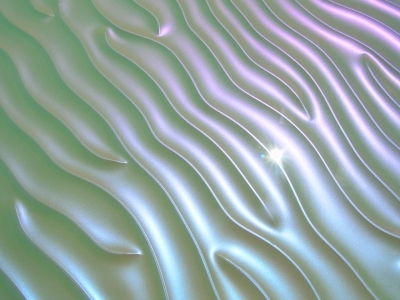 Our wave patterns such as Long Wave flow like a serene ocean, while our Dune texture is the most exact representation of real dune ripples ever made; where the metallic back coating becomes the sparkling grains of sand within the dune field. John drew the molds based on actual high resolution dune field photos of the planet Mars taken by the Mars Reconnaissance Orbiter spacecraft, so the patterns are truly otherworldly, and are a great example of just how far outside the box John thinks. The most impressive makeup in the Wave texture line is dichroic with a mirrored backing. In which the transmitted colors come through the face, as well as the reflected colors, creating some remarkable opaque surfacing options. 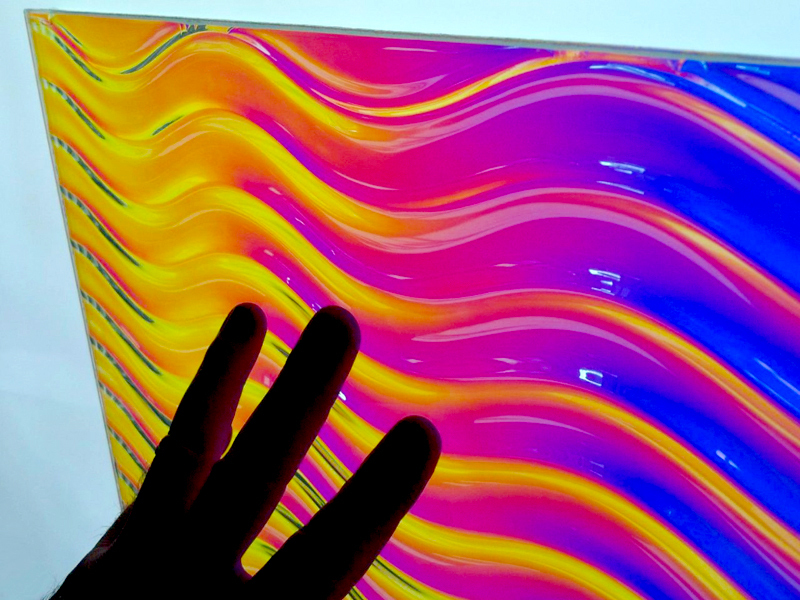 Dichroic layers are formed with high adhesion resins against glass or laserable PET substrates using molds in our custom made twelve foot ovens to result in variable color effects, with actual 3D topography on one side. 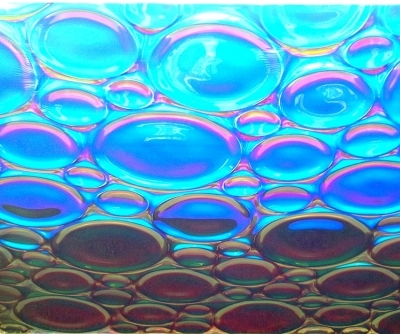 This dichroic side is protected by a layer of hardcoated AR (Abrasion Resistant) PET film and is suitable as a finished surface; so that both sides can be exposed in translucent applications like restaurant divider walls. Opaque laminations such as Dune are supplied with protective felt backing for adhering to most substrates. 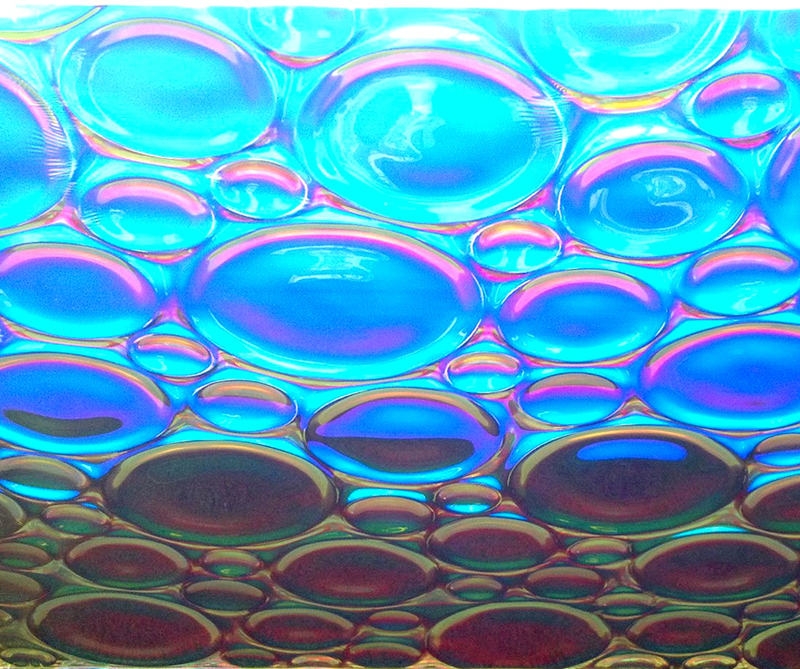 The applications and substrates with which our Impressed Textures can be used or integrated are virtually limitless. Both single and double paned safety glass are common, as well as PET, acrylic, and IGU fab.